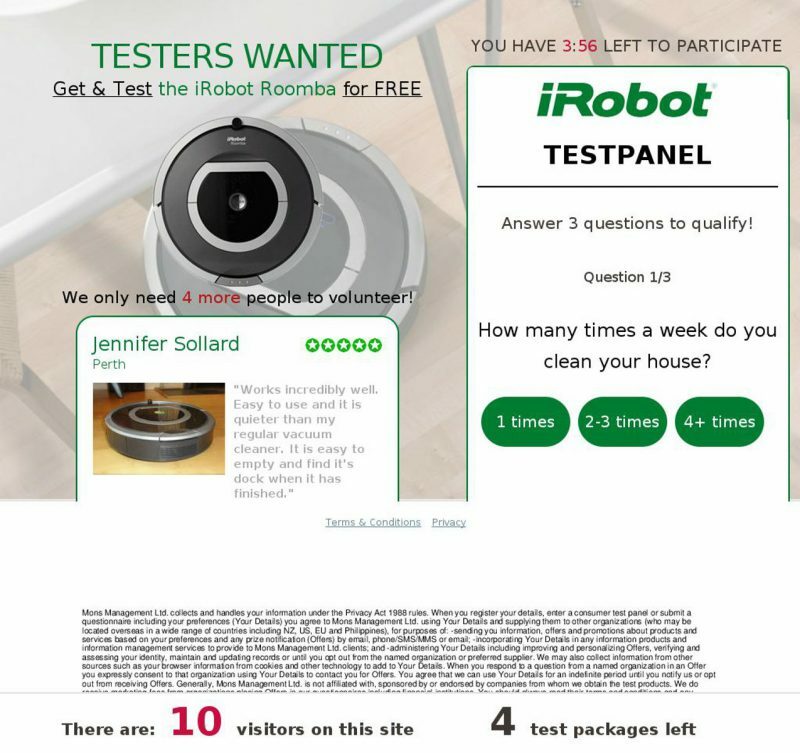 This particular scam email is offering a free cleaning robot (Roomba) for your opinion, but you need to visit the website to become a ‘volunteer’. 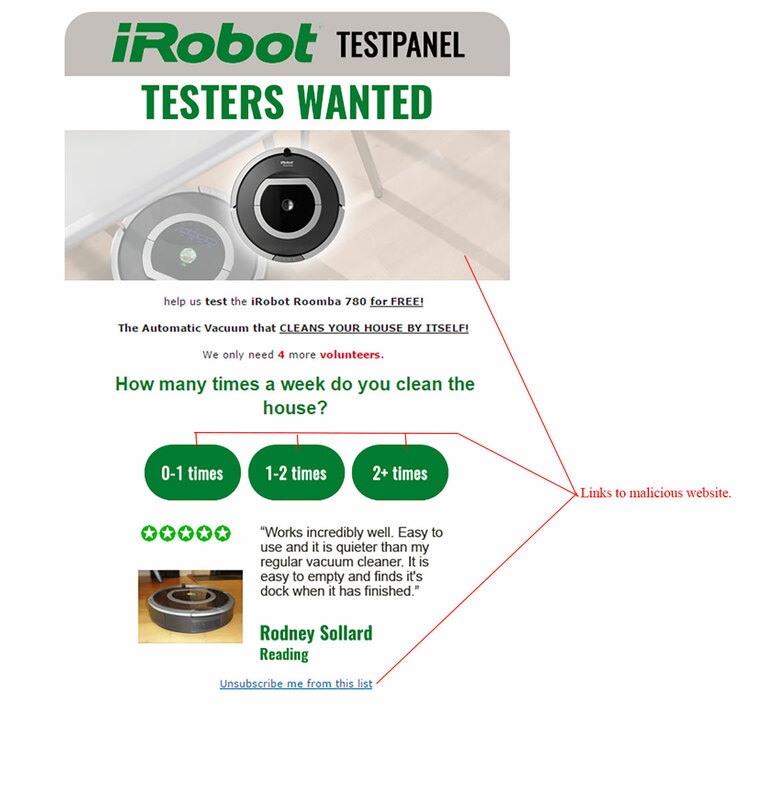 The subject line reads “Get a Cleaning Robot for your opinion”. Do not trust this email, it is a hoax attempting to infect your computer with malware. Figure A is a capture of the email caught by our filters. You can see it is branded well and definitely catches your attention. The sender is shown as “iRobot for your opinion” – however looking at the email address it is clear it is not legitimate. Clicking anywhere in this email is dangerous as all of the images are linked to the malicious website. The criminals have used a question in the hopes you will click the link to answer it, which will go through to the malicious website. They then display a review of the email on the website to increase your trust. Do not click any images, questions or even the unsubscribe link in this email. By hovering over the link you can see they go to an untrustworthy source. In a secure sandbox, we were safely able to access the next step in the scam. Figure B shows the landing page you will receive if any links in the email are clicked. Again, it is well designed and encourages you to answer 1 of 3 questions. The time limit is a scare tactic so you will answer the questions as quickly as possible. If your curiosity took you this far, then we’ll emphasize again to not click any further, it is an attempt to infect your computer with malware. Some final advice, always check the senders email address and link URL’s to be sure of an emails intentions. When in doubt, do not open the email at all.